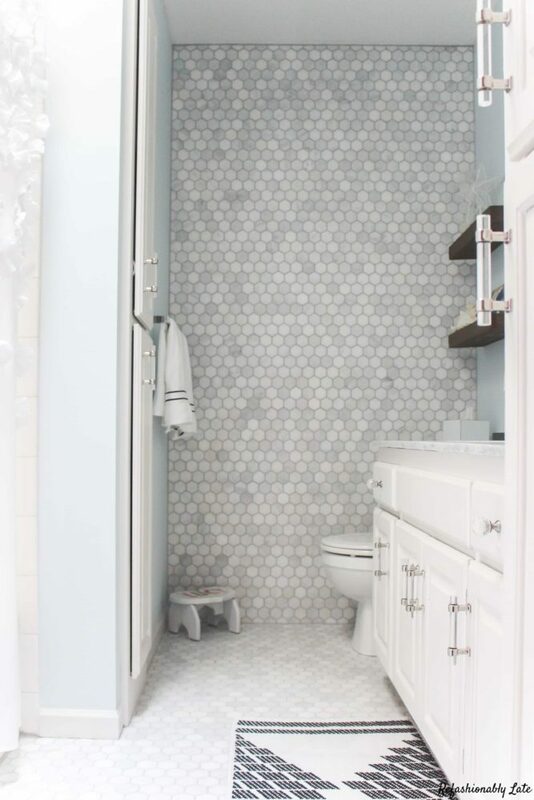 We’re getting ready to embark on a big bathroom renovation in our kids’ bathroom, so i thought we could all get in the mood today by checking out some gorgeous DIY bathroom renovations that are sure to get your inspiration flowing! Corey and I have officially begun working on our kids’ bathroom! It’s going to be a full gut job, complete with new tile, a new vanity, a new toilet – everything goes! I’ll share way more details later, but this renovation is way overdue and I’m so excited to watch it come together. 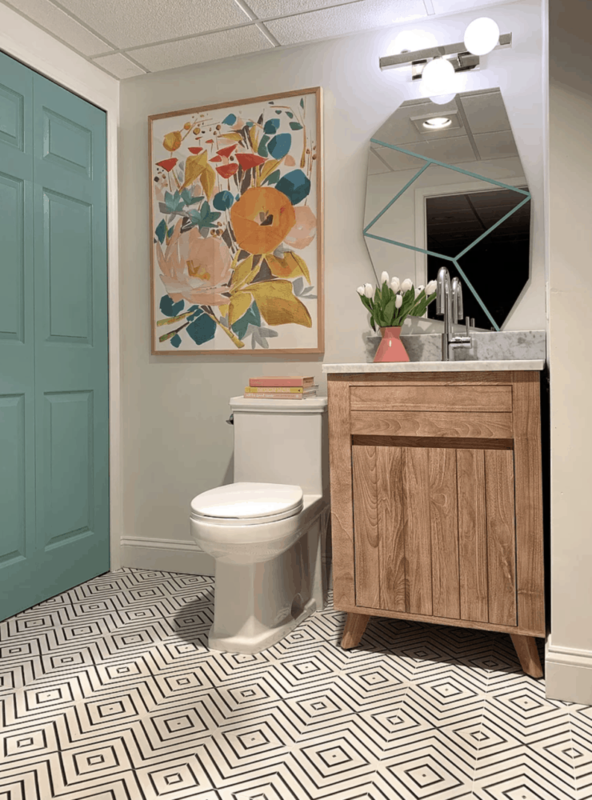 I always like to share some inspiration when I embark on new projects, so today we’re going to look at some gorgeous DIY bathroom makeovers to get the inspiration (and excitement) flowing! I’m obsessed with this bathroom my friend Haneen just finished – the tile is so good that vanity is perfect, and the colors are so pretty. 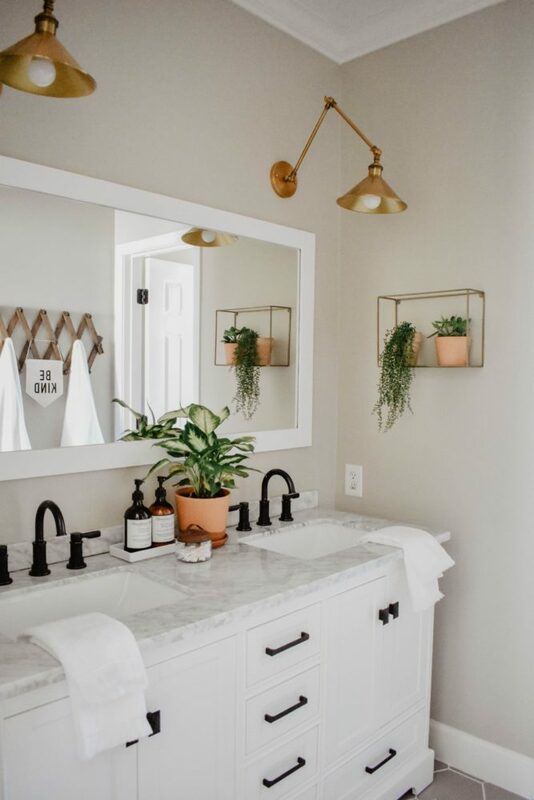 This bathroom is such a good reminder that a small bathroom doesn’t have to be short on style! The walls! The vanity! The crisp colors! 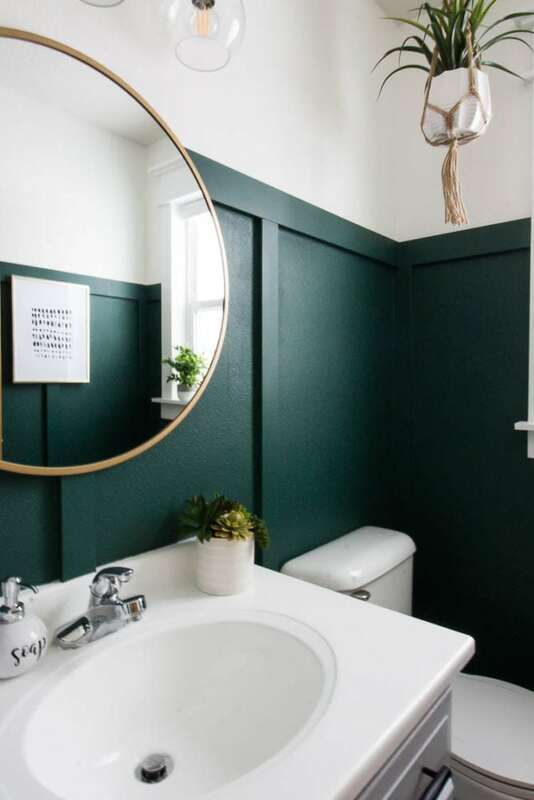 I’m all about this cozy bathroom Jamie designed, and I think it’s safe to say that I’m just generally a big fan of bathrooms with bold designs! 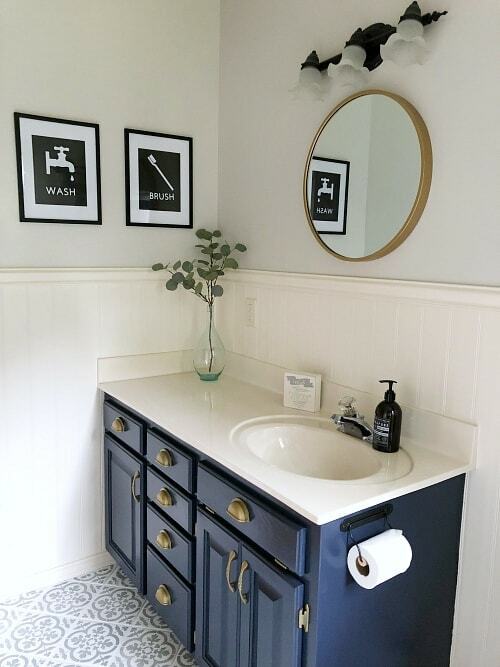 I love the wood vanity in this bathroom (I think I’m sensing a theme with that! ), and the light airy feel just makes it so welcoming. Of course, I also think a barn door is always a good idea. I never get tired of dark walls! This blue is just gorgeous, and it plays so nicely with the other, lighter colors in the space. This is a small bathroom but it packs a big punch, and the finished product is just beautiful. I cannot get over the impact of the tiled wall in this space! I love the decision to have the wall tile match the floor, and the light and airy colors in this bathroom are just beautiful. 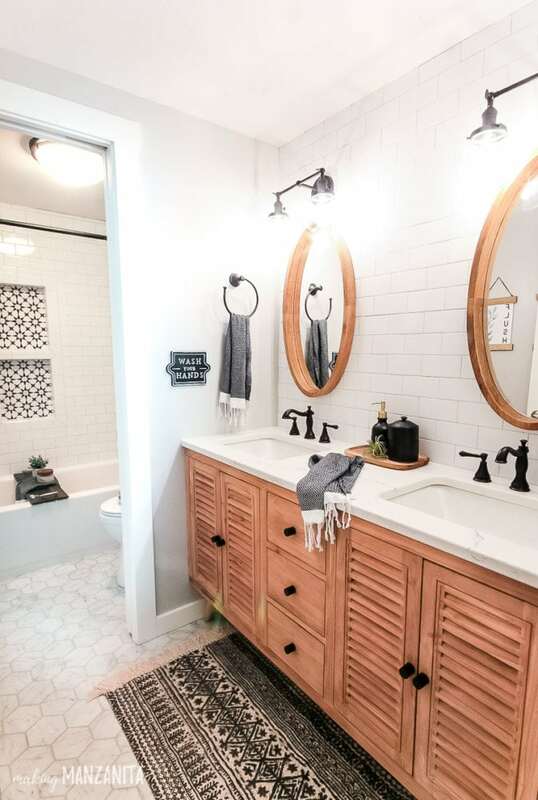 This modern farmhouse bathroom is full of pattern and just so great. 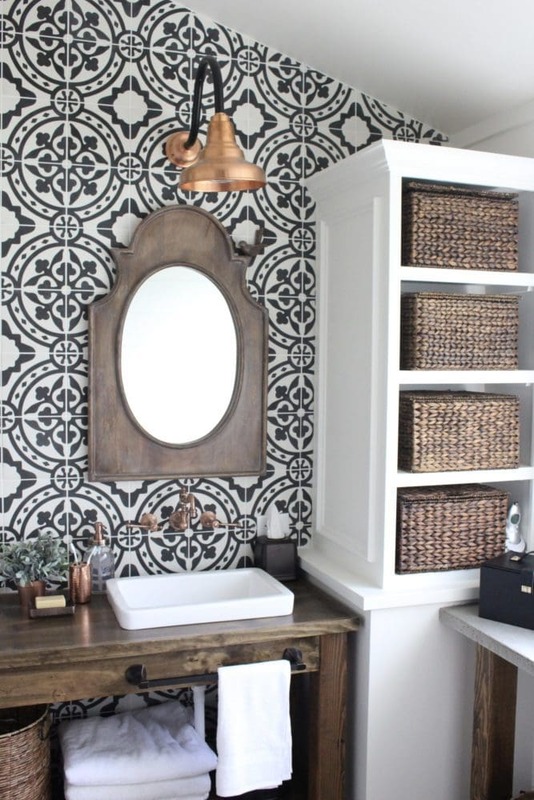 I love the wall tiles Amy chose and that custom vanity is perfect! Oh, and can we talk about the copper faucet?! I may or may not be drooling a little bit. 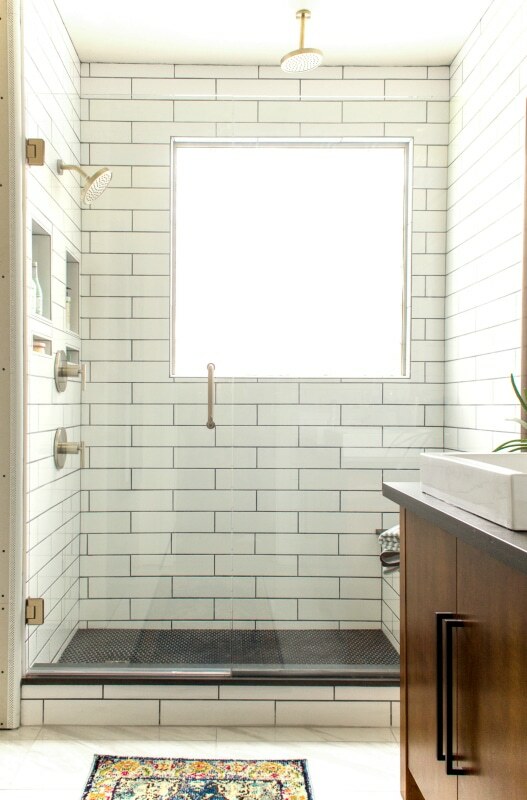 Subway tile is always a classic and I like the fresh feel of this skinny version. 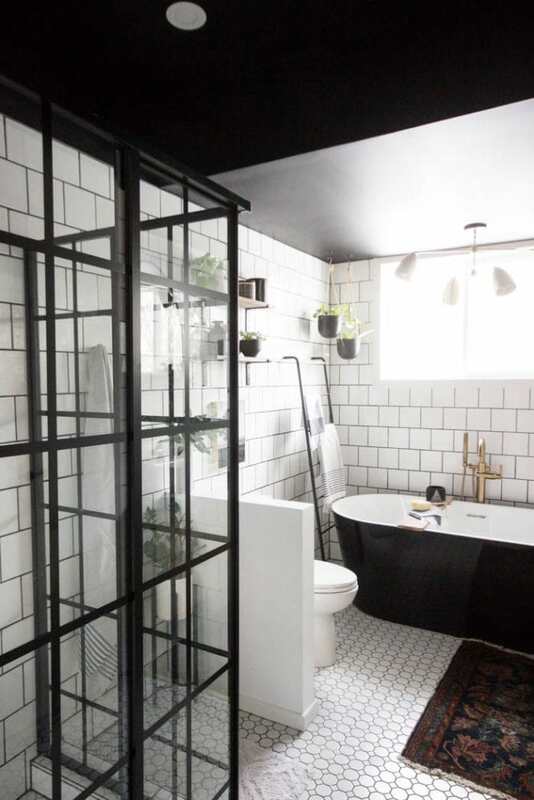 I’ll never get tired of seeing white subway tile with black grout, and that giant window in the shower is everything. 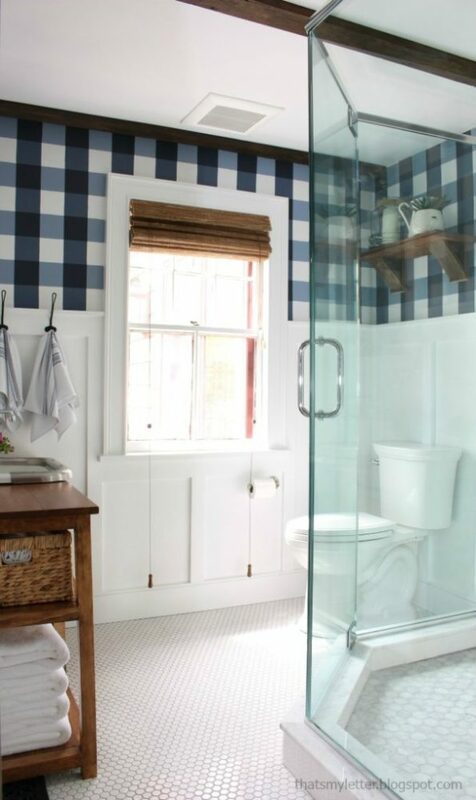 You’d never know this bathroom didn’t have a window – it feels so bright! 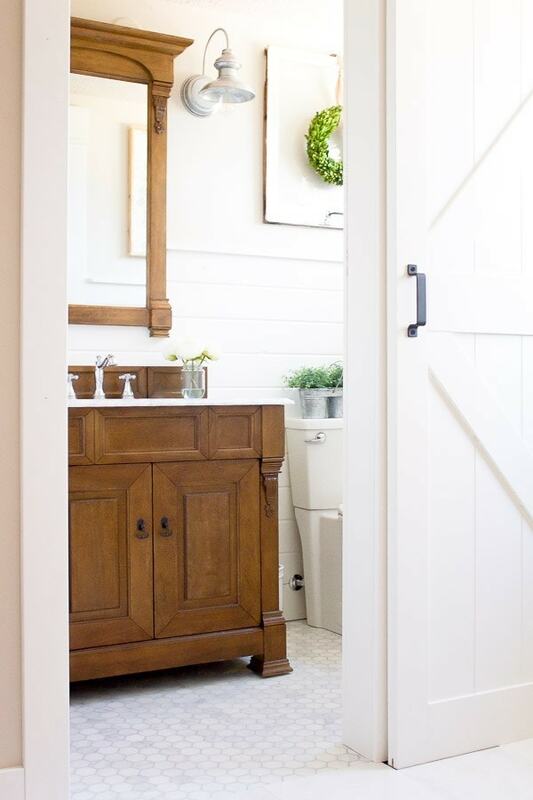 The slats on the vanity doors make my heart so happy, and I always love a larger-scale hexagon tile. Oh, and I’m a giant sucker for that adorable accent tile in the shower, too. Now this is a colorful bathroom! 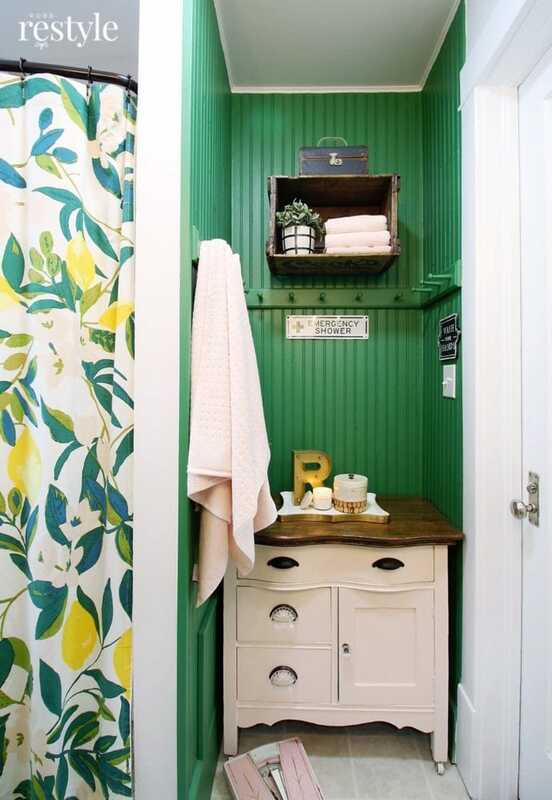 I love the kelly green walls, and that shower curtain is too cute! Plus, the combo of blush pink with bright green is just so fun and not a combo you see nearly often enough. 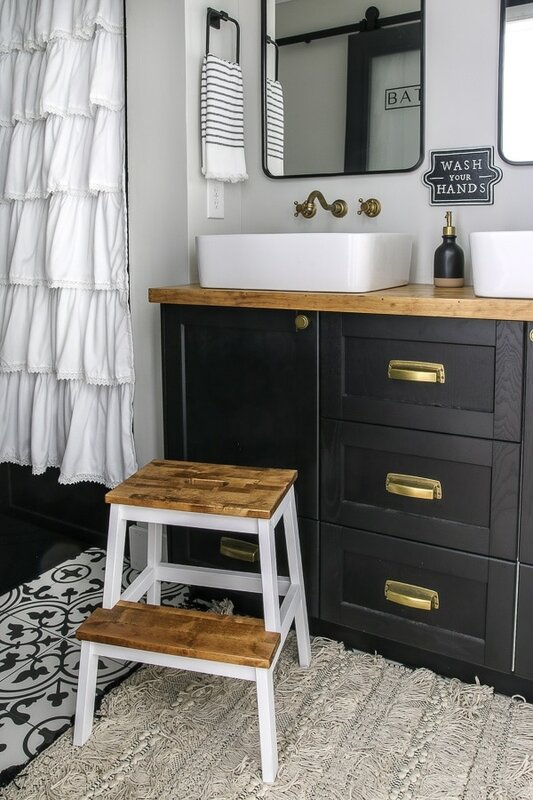 Those vanity lights are such a fun choice – and I love the rack on the back wall for the towels in this bathroom. This one is great proof that neutral doesn’t have to be boring, and this bathroom feels so elegant. Do you see that barn door in the mirror? SO GOOD! Of course, I also love the tile, the ruffled shower curtain, and the vanity in this bathroom. Actually, could we just pick this bathroom up and put it in my house? Thanks. I’m such a big fan of this dark green color I’ve been seeing all over the place lately! Emily did this bathroom on a shoestring budget and in just a few hours at a time and I think the effort totally paid off! Oh, hello. 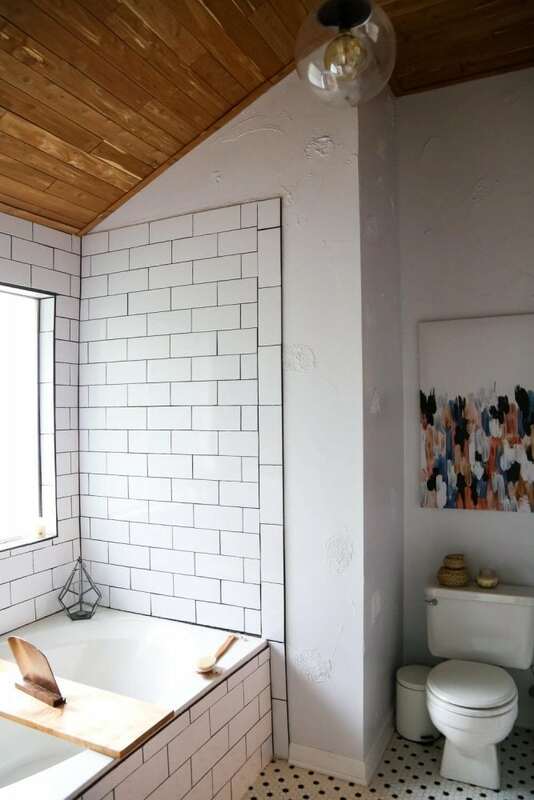 I’m sure you’ve seen this bathroom from my friend Lindi before, but can we just take a moment to acknowledge how good it is? Everything from the tile to the ceiling to the shower surround to the tub are all PERFECT! This is another easy bathroom renovation on a budget – my favorite kind! 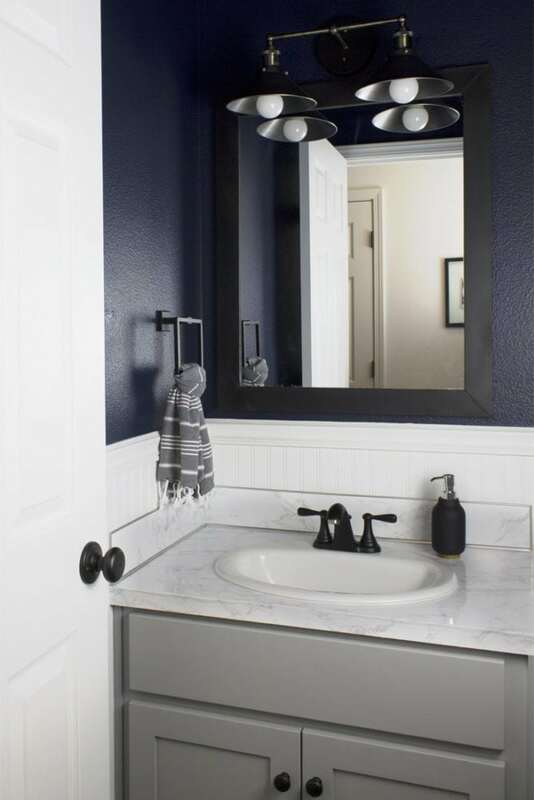 Would you believe this bathroom makeover was done with a budget of just $100?! So, so good. The pink tile! I cannot even handle it. 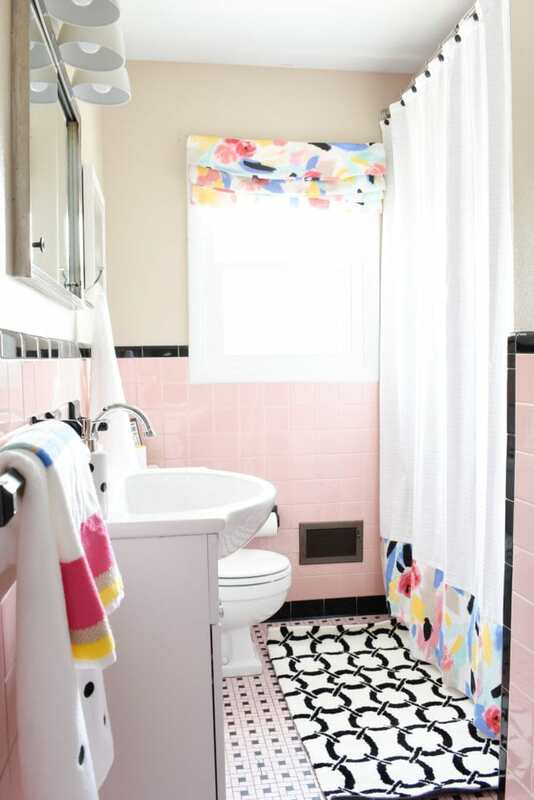 I dream of someday living in an older home with an adorable pink bathroom like this – it’s such a fun challenge to work with the dated tile and make it feel fresh and modern, and this bathroom nails it! Want even more bathroom ideas? Here are a few ideas from the Love & Renovations archives! We also tackled a small bathroom makeover in just a weekend! Here’s a post with all of the details on every bathroom we tackled in our old house. I’d love to hear which bathroom is your favorite! We’re so excited to start spilling the details of our big bathroom makeover, and I hope it turns out half as good as these. Some of the fresh ideas that I have ever heard for the bathroom renovation. Thank you for sharing.